Tomorrow in Dalton, Georgia (B) is the next to last race weekend of the year. We are hoping to make a fun trip out of it, leaving right after church (A) and heading to the race, then after the race heading to Rome, Georgia (C) to meet one of Kristine’s friend who just moved there before driving on home (D) so I can be ready for class Monday morning. We’re looking forward to some nice fall weather and hopefully a good result at the race! Velonews published an article that briefly mentions the race. More information about the race can be found on the Raisin Hope website: Raisin Hope: Tour the Town Criterium. 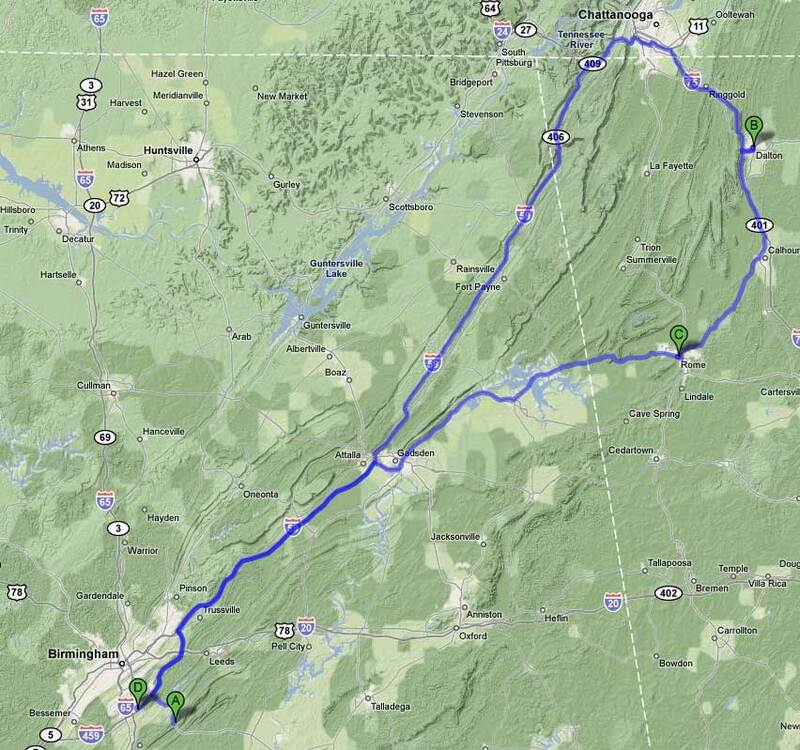 Here’s our travel plans carefully avoiding (hopefully) all the traffic associated with the Talledega NASCAR race weekend. This entry was posted in Racing and tagged calendar, criterium, map on October 4, 2008 by kartoone.